This highly innovative and successful product remains a consistent seller. Just stretch it between two stakes and it will start to emit the vibration. It also deters rabbits and other pests. 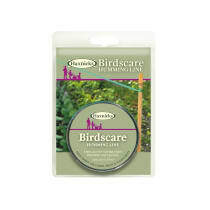 Birdscare is harmless to crops, birds and animals.